The adult female fly is active during summer and early fall. Eggs are retained in the body until they hatch. Flies deposit as many as 500 larvae in the nostrils of sheep. The larvae then move up the nasal passages to the nasal and frontal sinuses. The larvae remain in the sinuses for 8 to 10 months and then are sneezed out of the nostrils. The larvae pupate in the soil with the pupal period lasting 3 or more weeks, depending on temperature. Adults then emerge from the pupae and may live as long as 28 days. I got a bot fly larva in my scalp once. My dad sprayed this vile dog medicine on it and it died in there, and my body absorbed it. TAKE THAT BOT FLY. The affectionate name for these flies is snot bots. Wow. It even *looks* like something a sheep horked out of its nose. isn't it a cicata? it really looks like it. in brazil we call it "Cigarra". it doesn't have any poison or sting, but it is REALLY creepy! I agree with lyra bird. Lots of brazilians here, it seems! Saudacoes, compatriotas! Here's a common brazilian cicada... part of it. Cicadas lay their eggs on the ground, though, not in animals. sheepish fly - very very eeeew! So if one of these infested your car, could you call it an autobot? Sorry, didn't mean to be decepticon. We have similar types of flies in Brazil that lay eggs in domestic animals. It was a lot of trouble for us to keep our dogs free of them. Poor doggies. I wish I had a photograph to show of one time when a fly must have laid hundreds of eggs in my dog's leg, as the worms tore a huge hole... like the size of a lime, and inside it was swarming with wiggling larvae. Yuck.. smelled fowl too. The vet gave us calamine ointment to shove in the hole, and that killed everything and sealed the hole pretty quick. Freaky! 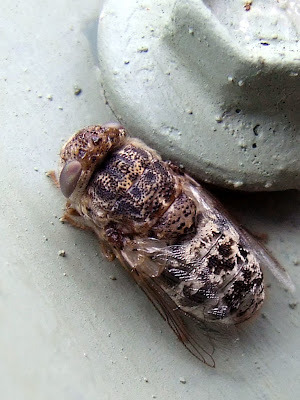 where can I post a photo fpt id of a bot fly besides bug giide?